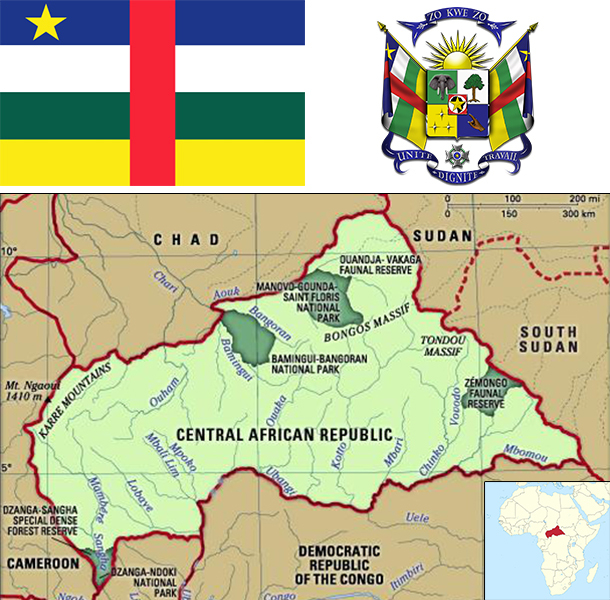 The former French colony of Ubangi-Shari became the Central African Republic upon independence in 1960. After three tumultuous decades of misrule - mostly by military governments - civilian rule was established in 1993 but lasted only a decade. In March, 2003 President Ange-Felix PATASSE was deposed in a military coup led by General Francois BOZIZE, who established a transitional government. Elections held in 2005 affirmed General BOZIZE as president; he was reelected in 2011 in voting widely viewed as flawed. The government still lacks full control of the countryside, where pockets of lawlessness persist. The militant group, Lord's Resistance Army, continues to destabilize southeastern Central African Republic, and several rebel groups joined together in early December 2012 to launch a series of attacks that left them in control of numerous towns in the northern and central parts of the country. The rebels - unhappy with BOZIZE's government - participated in peace talks in early January 2013 which resulted in a coalition government including the rebellion's leadership. In March 2013, the coalition government dissolved, rebels seized the capital, and President BOZIZE fled the country. Rebel leader Michel DJOTODIA assumed the presidency and the following month established a National Transitional Council (CNT). In January 2014, the CNT elected Catherine SAMBA-PANZA as interim president; new general elections, originally scheduled for October 2015, have now been postponed to at least 2016. Subsistence agriculture, together with forestry and mining, remains the backbone of the economy of the Central African Republic (CAR), with about 60% of the population living in outlying areas. The agricultural sector generates more than half of GDP. Timber and diamonds account for most export earnings, followed by cotton. Important constraints to economic development include the CAR's landlocked position, a poor transportation system, a largely unskilled work force, and a legacy of misdirected macroeconomic policies. Factional fighting between the government and its opponents remains a drag on economic revitalization. Since 2009 the IMF has worked closely with the government to institute reforms that have resulted in some improvement in budget transparency, but other problems remain. The government's additional spending in the run-up to the election in 2011 worsened CAR's fiscal situation. Distribution of income is extraordinarily unequal. Grants from France and the international community can only partially meet humanitarian needs. In 2012, the World Bank approved $125 million in funding for transport infrastructure and regional trade, focused on the route between CAR's capital and the port of Douala in Cameroon. After a two-year lag in donor support, the IMF's first review of CAR's extended credit facility for 2012-15 praised improvements in revenue collection but warned of weak management of spending.